A fractal is a theoretical object that has infinitely many wiggly bits. Mathematicians prefer a more rigorous definition involving non-integer dimensions whereas fractal enthusiasts often focus on the self-similarity property of many (but not all) fractals. This means that when you zoom in anywhere into an image of a fractal, you can see the original image of the fractal re-emerge, no matter how much you zoom in. An example of such a fractal is shown below. You can see the six pointed flakes at every level. Many – if not most – things in nature are approximately fractal. Often quoted examples are ferns that show repeated self similarity in their leaves and the coastline of Britain that is “infinitely” wiggly. 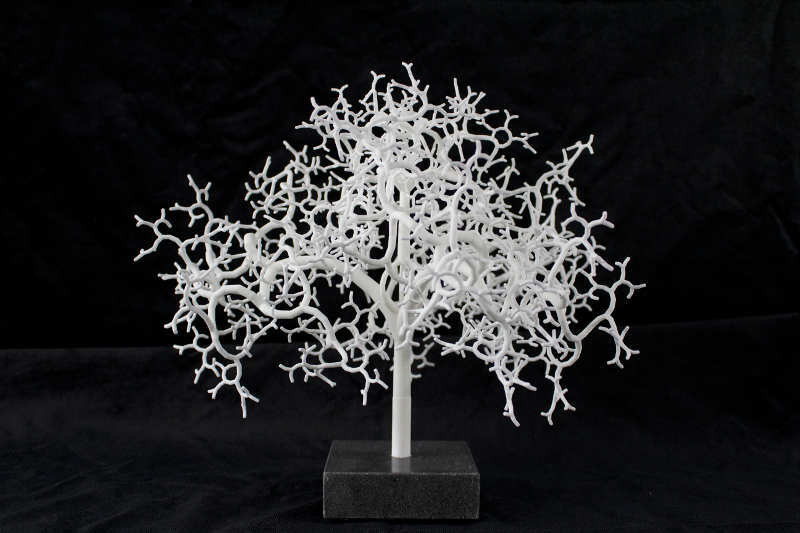 The 3D printed fractal below resembles a tree. The little branches have exactly the same shape as the bigger branches, they are just smaller. In addition to often being fractal, nature has a fundamental structure that is often quite different from the things made by man. When you observe a flowering plant, it is easy to see how it is composed of a root system, a stem and branch system, leaves with nerve systems and then flowers that have their own architecture altogether. Is there a fractal structure between roots, branches, flowers etc? Indeed. We know from science that a flowering plant is a single living organism with its own genome, i.e. genetic code. This is where the inspiration for genetic fractals come from: complex and composite structures that are driven by a genetic code. Although the genetic code produces things that look very different, if you look carefully, you’ll see that flower petals, the shape of a flower and the shape of a plant and its leaves often resemble each other. This fractal relationship is due to the fact that every cell is produced by the same genome that itself has self-similarity in its patterns. Virtually all living organisms grow like fractals, i.e. cells split and essentially form a new branch of tissue on the organism over and over again. As such an organism grows, it forms shapes that emerge at different scales. As such, such organisms gave a fractal geometry. Because of that relationship between genes and living fractals, I call these things “genetic fractals”. 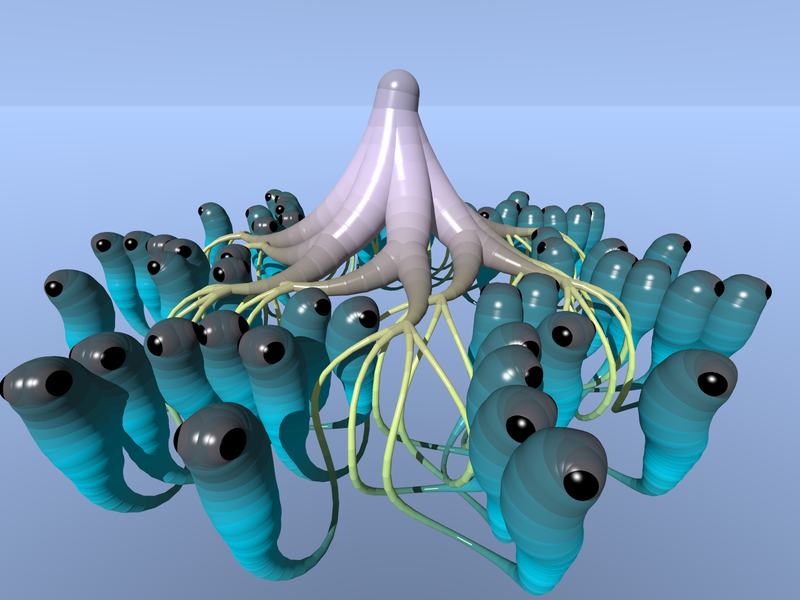 Emulating nature and creating interesting or bizarre organic looking fractals like the “Root Larvae” above is only one application of genetic fractals. We can also use them to ‘grow’ mechanical and other engineered structures by using mechanical elements rather than living cells. These are not necessarily useful objects but they point towards a different way of thinking about mechanical systems. An organic approach to engineering and design. Due to the genetic nature of these fractals, i.e. the fact that they are created from a sort of “artificial DNA”, we can do genetic engineering and stick bits of “DNA” from genetic fractal into another and thereby transpose some of the features of one to another. This is a very powerful design paradigm that I use to create these genetic fractals. I have also turned this into a design language and even a tool. More on www.geneticfractals.com. There is something profound in the confluence of symmetry and asymmetry, and the intricate manner of the genetic fractals. As far as usefulness, they inspire profound thought in me, and so are infinitely useful, at least to me. Thanks Thomas, I’m delighted you get it. Since I wrote that, there has been a kit of progress. 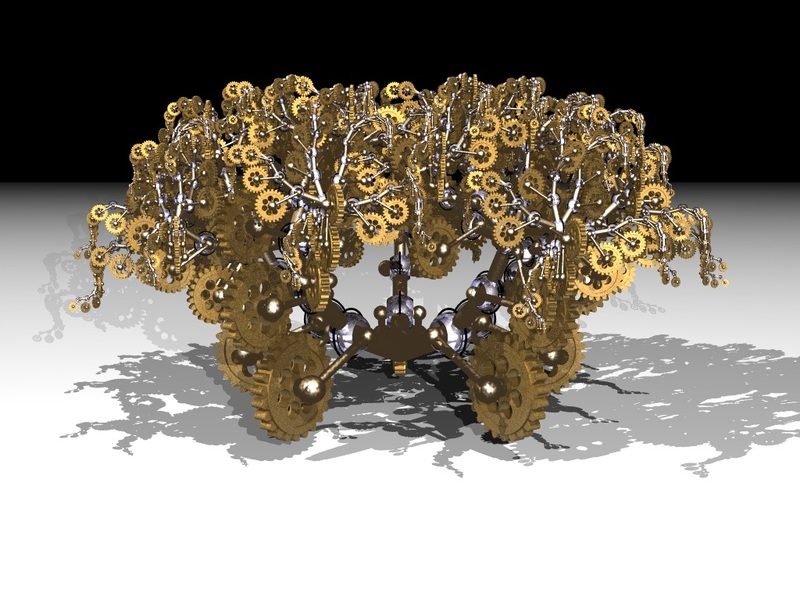 I am using genetic fractals as a design paradigm for 3D printing. More here: http://www.geneticfractals.com. I am now focusing on genetic fractals as tool for studying creation and evolution. I blog about this on my main blog geneticfractals.wordpress.com.